Set of 10 mirror blocks features hardwood frames with soft, rounded corners and Mylar mirrored double faced interiors. Sized to standard unit block measurements. Ages 2+. 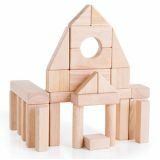 100 wooden blocks in four colors and nine shapes for your little builder to stack, build, and knock down! 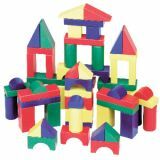 Bright, non-toxic colors add to construction and sorting fun. Ages 3 and up. What can we find today? 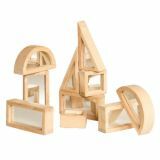 Collect trinkets, natural materials and sensory objects to place in the beautiful Treasure Blocks. 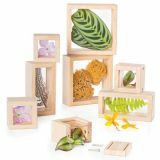 Smooth hardwood frames with inset, transparent acrylic windows have a removable panel to place small objects to observe or display. Ideal for color exploration and light table activities. 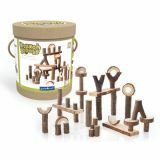 Holds marbles, beads, twigs, leaves, small toys and more. Two screws on the removable panel keep objects securely in place until ready to be replaced. Set of 8. 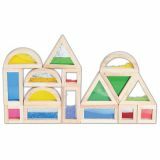 Largest Block measures 5.5″ L x 5.5″ W x 2″ H. Ages 2+. 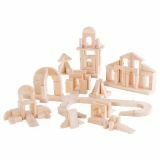 Designed to entice a child's inner architect, smooth-sanded rubberwood pieces encourage young builders to create buildings, arches and structures for towering block cities and quiet country towns. 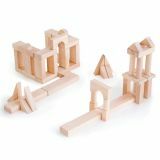 Unit Blocks teach engineering and geometry in addition to building fine motor control, cognitive function and problem-solving. 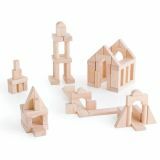 Adding Block Science Foundation Sets bring movement and physics into traditional block play. 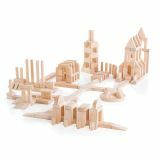 The combined Block Science System stimulates young minds and provides hours of continuous play and expression.